Cytological monitoring of cervical smears was undertaken in 15, 649 women attending Gynaecology Clinic of Queen Mary's Hospital, Lucknow, India (April 1971 - Nov. 1996). Cervical dysplasia was found in 6.7% and malignancy in 0.8% of the cases. The incidence of dysplasia and carcinoma of cervix was higher in women who revealed abnormalities of cervix on clinical examination than in subjects with healthy cervices (10.3% and 2.1% as against 4.2% and 0.02% respectively). The former group thus needs to be identified as high risk for harbouring early cervical cancer and be offered priority in a cytological surveillance study. Further 21.5% of the 132 cytologically diagnosed cases of carcinoma cervix were in younger women of 26-35 years. Hence yearly Pap smear testing is recommended for ail women irrespective of age and parity. Bone marrow smears of 96 patients (49 females, 47 males) with malignancy were studied Of these, 29 (30.21%) had evidence of bone marrow involvement. Patients with advanced stage of malignancy were more affected (41.46%; p <0.001). An increase in incidence was observed with advanced age, especially in females. Bone marrow involvement was more common in females than males (p<0.025). The primary sites were - breast (28.13%), stomach (16.67%), thyroid (14.58%), prostate (11.46%), colon (9.38%), lungs (9.38%), kidney (7.29%) and pancreas (3.13%). Bone marrow positivity was observed in malignancies of breast (51.85%), pancreas (33.33%), lungs(33.33%), stomach (25%), colon (22.22%), prostate (18.18%), thyroid and kidney (14.29% each). Metastasis in liver (50%) was the most frequent accompaniment of bone marrow involvement, followed by lungs (9.09%) and bones (9.09%). Bones near the primary site were more involved. No definite relationship existed between positivity of bone marrow and skiagram. Bone marrow examination can be applied as a important diagnostic tool in detecting dissemination of malignancies in patients with advanced disease. Cytohistopathological correlation and assessment of diagnostic accuracy of FNAC was possible in 49 of 91 cytodiagnosed orbital masses. It showed 80% sensitivity, 72.4% specificity, 95.5% Positive Predictive Value (PPV) and Negative Predictive Value (NPV) of only 33.3%. On thorough review of false positive and all negative cases reported earlier, the false negatives were reduced to only two hence increasing the NPV from 33.3 to 66.7%, sensitivity from 72.4 to 91.3% and efficiency from 73.5 to 86.2%. Both sampling error and the method of interpretation in cytologic reporting affect the diagnostic indices. While the false positive reports affect the PPV, false negative reporting is equally important as it reduces the NPV. Therefore all negative and false positive reports should be critically reviewed along with individual follow up of all the cases to ensure a better quality assurance in diagnostic cytology. Self administered questionnaire-based audit of cytopathological services prevalent in India was conducted. Of the 55 cytopathologists addressed, only 47 responded promptly. Of these 47 respondents, 68% provided diagnostic cytological services on a regular basis and the rest occasionally. Seventy two percent respondents preferred to perform aspiration themselves. The sensitivity, specificity and predictive values were calculated as "sometimes" by half of the respondents and a median score of 3 on a 5-point analog scale was obtained for this question. The inter and intra observer variability were "often/routinely" calculated by 40% of the respondents with a median score of 3 on a 5-point Likert Scale. On questions like, differentiation of the classes of report, scheduling the cytology time in their routine, evaluating the level of diagnostic help by post cytology probabilities, (pre test-post test probability) were all below 50% with low median scores. These results indicate that cytology as a diagnostic tool will gain even more credence if stringent methods of quality assurance are adopted by those who practice it. The study has allowed us to create the quality assurance instrument for the audit of diagnostic cytological services. Fine needle liver aspirates from 48 patients with hepatic malignancy were cytomorphologically categorised as hepatocellular carcinoma (HCC), metastatic carcinoma and carcinoma not typed (where the typing was not possible) in five, 32 and 11 cases respectively. The features found to be strongly suggestive of HCC were a trabecular or acinar pattern, presence of cytoplasmic bile or intracytoplasmic hyaline bodies, naked nuclei in the background with pseudonucleoli and prominent eosinophilic nucleoli. Alphafetoprotein (AFP) was detected in all five cases of HCC, but in only three of the 32 metastatic tumours, one of which was metastasis from a primary testicular tumour. Carcinoembryonic antigen (CEA) was found in four of the five HCC and 20 of the 32 metastatic tumours. Use of AFP and CEA helped categorise eight of the 11 cases not typed on morphology. Neither the positivity nor the pattern of CEA was of value in differentiating the two groups. However, AFP proved to be a fairly reliable marker of hepatocellular differentiation. This pilot study was performed on twenty two women suffering from node-negative breast carcinoma as diagnosed by Fine-Needle Aspiration Cytology, correlating cytological grade with DNA studies on the aspirates. The data suggested that with an increase in cytologic grade, there is a trend of a shift from diploidy to aneuploidy, and a rise in the S-phase fraction. All the four grade I tumours were diploid with a low S-phase fraction. All the six grade III tumours were aneuploid, four of which showed a high S-phase, one showed a low S-phase; and in one, S-phase could not be determined. In the twelve patients clustered in grade II, there, was an almost equal distribution of cases showing diploidy and aneuploidy, and of a low and high S-phase fraction. 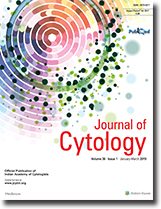 It is concluded that cytologic grading in conjunction with ploidy and S-phase on FNA samples of breast carcinomas could prove to be a useful prognostic marker, the validity of which needs to be ascertained by carying out similar studies on a large number of women suffering from breast carcinoma combined with long-term follow up. The chromatin texture of nuclei from breast carcinoms were described by image morphometry in this pilot study on nine FNA samples. The series included three patients each of Grades I, II and III. The parameters employed were; Skewness Index, Kurtosis Index, Variance of Optical Density, Coefficient of variation, Run Number, and Uniformity of Run Length. The data obtained more or less reflected the visual impressions regarding the chromatin texture of the nuclei studied. Larger studies are recommended in order to assess whether morphometric description of chromatin can complement the existing grading systems. Exfoliated ovarian adenocarcinoma cells in the ascitic fluid bearing tufts of cytoplasmic projections were identified. These eosinophilic projections varied from cell to cell. Many of them were long and slender, with terminal plate and showed periodicity. Some were short and slender with pericellular distribution. These ciliated hair like processes and tufts of microvilli are an exceedingly rare phenomenon observed on neoplastic cells. We describe a case of serous papillary ovarian adenocarcinoma with exfoliated surface specialised adenocarcinoma cells in a 47 year old woman. This is a unique feature of cytoplasmic differentiation observed by light microscopy. Salivary duct carcinoma (SDC) is a distinctive but aggressive neoplasm arising from the major salivary glands. Although numerous case reports are available, a preoperative diagnosis has not been made. We report the FNA features of a case of SDC. The possible diagnostic features of this unusual neoplasm included a resemblance to an infiltrating duct carcinoma of the breast in association with a characteristic cell type and a cribriform pattern. A case of Mucinous Cystic Tumor of Pancreas (MCT) is presented in a 60 year old male. The diagnosis was made on FNAC and confirmed by histopathology. Review of literature is discussed briefly.